SThe IJburg archipelago is starting to take shape. Land reclamation for Centrumeiland has started and the urban plan for Strandeiland has been presented to the Mayor and Aldermen. 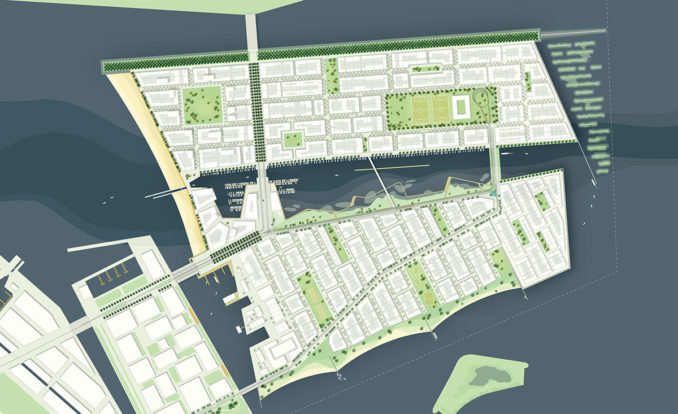 The Strandeiland Urban Development Plan provides direction for the further development of the second IJburg phase and was developed by the IJ-Atelier team (Municipality of Amsterdam, Mecanoo, Faro Architecten and DELVA). With 8,000 houses and 150 hectares, Strandeiland is one of the largest future urban districts in Amsterdam. 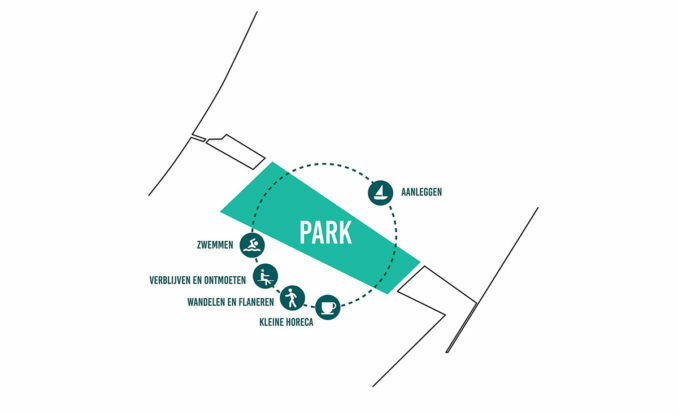 Located on the IJburg Bay with a large city beach, a extensive inland waterway (het Oog) and a rugged natural edge of the IJmeer on the south side, this will be an exciting new part of the city. Strandeiland will be an island for everyone: to live, work and recreate. All this with a high ambition in the area of sustainability. 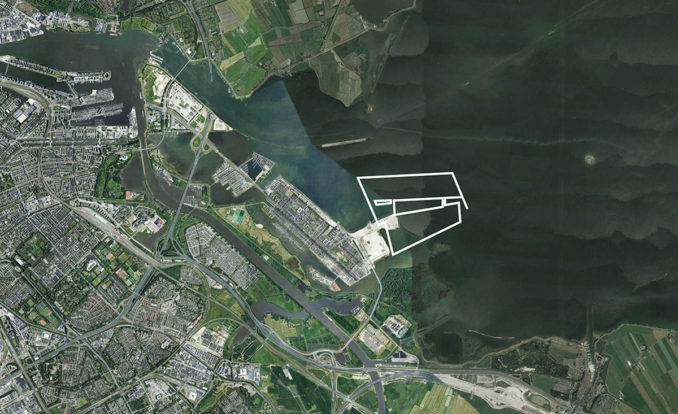 The first phase of IJburg is located on the Diemerpark coastline, while the second phase is entering the open water for the first time. This gives rise to the main choices of the design. 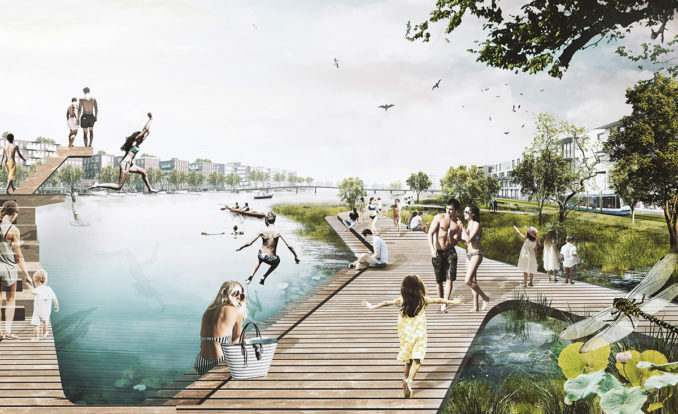 The urban design concept for Strandeiland, for example, uses the name of the oergeul (the old river basin of the river Vecht) and puts it into action by creating a large inland waterway with a high quality of design and places to stay for the residents of Strandeiland: called het Oog. Around het Oog are the two neighbourhoods, the Pampusbuurt, to the north and the Muiderbuurt, to the south. The two islands differ in character and have a diversity in architecture and urban design. The Pampusbuurt characterised through streets in east-west direction and a formal form of urban development. The Muiderbuurt, on the other hand, is more informal in character and has a street-side corridor in a north-south direction. The landscape responds to these contrasts in which the formal urban design of the Pampusbuurt is supplemented with city parks, rows of trees, hard quays and a rectilinear design language. The Pampusbuurt is characterised by robust outside edges and enclosed green spaces in the neighbourhood itself. Through the green streets, parks and squares, the open water is always close and easy to reach. The Muiderbuurt is structured by three green fingers. 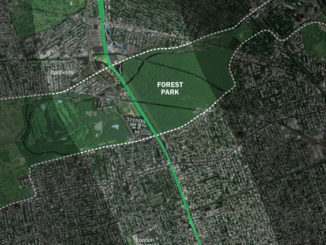 That will take the landscape into the neighbourhood, with clustered groups of trees and a freer design language. Characteristic for the Muiderbuurt is the topography; a high back that runs through the neighbourhood in the longitudinal direction. Across the backbone, the residential streets run to the water, so the water on both sides of the Muiderbuurt always feels close. In this way the Muiderbuurt opens up to the landscape of the bays. Het Oog responds to both identities and brings them together, it forms the blue heart of Strandeiland: a place of stay, meeting and activity. In the south there is a park bank, along which the tram runs. On the North side pedestrians can get close to the water via low quays, stairs and ramps. There is a long jetty in the inland waterway where visitors and residents can moor their boat. A long platform on the South side connects the bridges and the dam over the inland waterway and offers opportunities for a varied program with play areas, fitness and restaurants. The orientation on the landscape with sun, wind and water give direction to the design. For example, on the West side is the city beach on the IJburg Bay, which is oriented towards the afternoon and evening sun with the silhouette of the city in the background. This is a place for recreation, a place to swim or a place to simply relax. 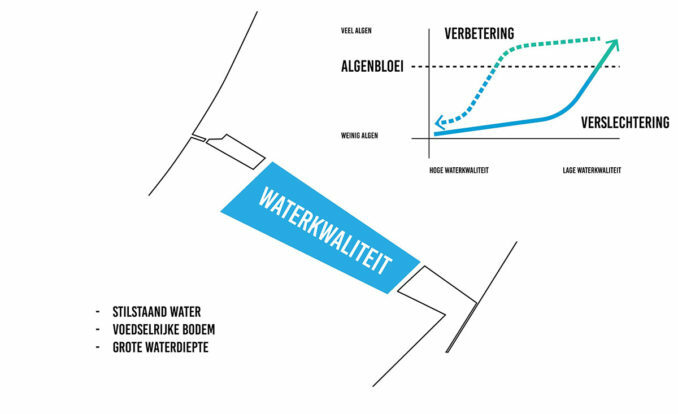 An important condition for the optimal functioning of het Oog; the blue heart of Strandeiland, is good water quality. Due to the low flow rate, the chance of algal blooms and blue algae arises, which would limit the use of the water. 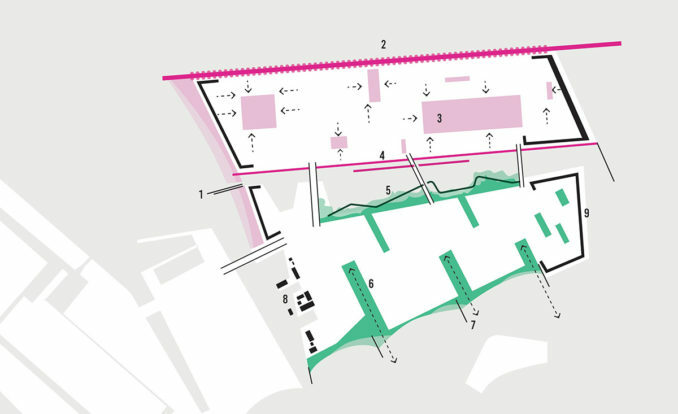 The most important element to create a robust system is the introduction of the green natural bank along the Southern quay, which will function as a large landscape filter. 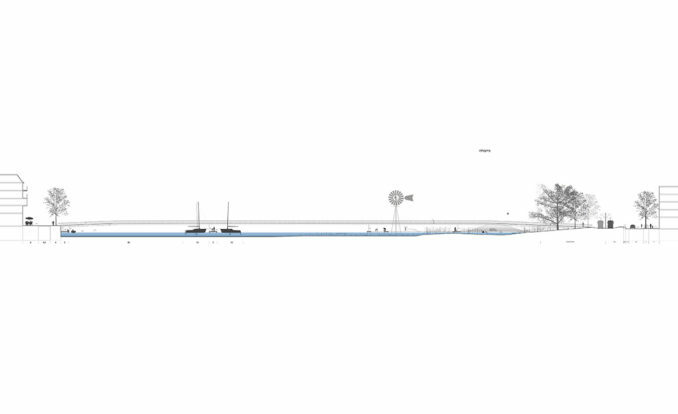 An average water depth and the design of the quays stimulate the development of water flora, which makes het Oog an integral part of a robust ecosystem. A recreational layer is added to the Binnenwater, which consists of a deck that floats over the green bank and connects with the surrounding streets. In addition to experiencing nature up close on the boardwalk it will be a place where people congregate and stroll, visitors and residents alike can jump from the deck to cool off in the inland water, sunbathing, drinking tea in the pavilion or renting a boat in the integrated canoe rental. This will make Binnenwater a place where the residents of this new part of IJburg come together and can escape from the bustle of the new part of the city. 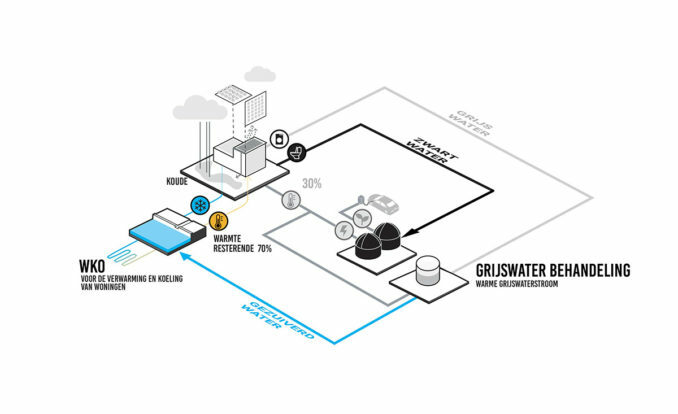 system in which wastewater can be used for the recovery of raw materials, energy and heat. 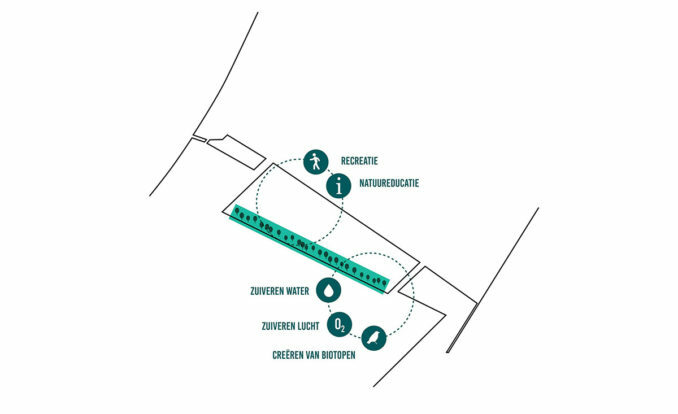 All interventions together will make Strandeiland an emission-free and energy-producing new piece of Amsterdam. With an eye on the increasing traffic congestion and the desire for a healthy living environment; a smart and emission-free mobility concept is chosen for Strandeiland. 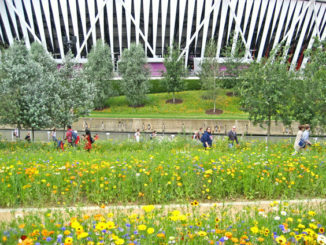 Walking, cycling, electric public transport and electric cars are given priority. Furthermore, the tram 26 from Amsterdam Central will be extended from Haveneiland to Strandeiland as well as being connected by an electric HOV bus with the stations Bijlmer Arena and Weesp. Smart emission-free options are further elaborated, such as access to shared electric vehicles via mobility hubs and smart mobility concepts. In the next fifteen years, land will be created and the living, work and recreation program will be realized. In the summer of 2018 a start was made on land reclamation, with the first phase of Strandeiland and over 80 hectares of land.